Rent a kayak or take a high speed river boat. The rental resort's kids club is stocked with fun crafts and games. Take out a cruiser and explore the expansive resort. Head to the pool for a refresher. Put around Captain Hook with a view of the lake. Pick up essentials, treats, and Disney souvenirs. What kid can say no to at least one go at the arcade. 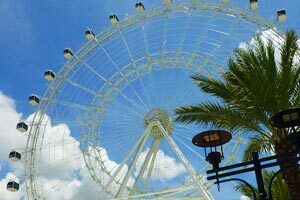 You have free shuttle access to Disney, Universal, and SeaWorld. Enjoy a drink by the pool at any of two pool bars. Studio, 1-bedroom deluxe and 2- and 3-bedroom condos have jetted tubs – perfect for relaxing after a long day. Westgate Lakes Resort & Spa is conveniently located between Walt Disney World® and Universal Orlando®. Don’t bother unpacking once you get to your condo, just get changed into swimsuits, slather everyone head to toe in sunblock and get ready to be amazed. You have seven outdoor pools to choose from, along with seven hot tubs. Or lounge with a cocktail from one of the three poolside bars. When you get hungry Cordovano Joe’s Authentic New York Style Pizza located on-site, offers poolside delivery. You won’t even have to dry off. Get in touch with your inner-Michael Jordan on the basketball courts, or your inner-Serena Williams on the tennis courts. If you want a more traditional workout, head to the fitness center, they even offer personal training sessions. Need an afternoon pick-me-up? Sid’s Bistro serves Starbucks. Treat yourself with a visit to Serenity Spa by Westgate. They offer facials, massages, nail and hair treatments and airbrush tanning. Spa treatments are also available for teens ages thirteen through fifteen, and kids age twelve and under will love the “mini spa” treatments. Studio condos sleep four guests. Kitchenettes with a mini fridge, microwave and toaster have what you need to make the basics or heat up leftovers. One-bedroom condos sleep four guests. Fully equipped kitchenettes with full-size refrigerator give you options. Stop by the on-site marketplace for groceries or for more variety, the Walmart Supercenter. Feel like spaghetti? Your two-burner stove can help with that, and the dishwasher makes clean-up a breeze. Upgrade to a one-bedroom deluxe for a full kitchen with an oven, giving you even more options. Two- and three-bedroom condos sleep eight to twelve guests. Full kitchens have everything that you need to whip up anything from sandwiches to multi-course meals. The kids will be begging to help make your famous chocolate-chip cookies (and be the official taste testers). Don’t feel like cooking? No problem! Dine at Drafts Sports Bar & Grill or order room service, you won’t even have to leave your condo. Flatscreen TVs with DVD players are perfect for family movie night. Bring favorite movies from home, pop some popcorn and call everyone into the living room. First kid on the couch gets to choose the movie. Select condos have in-suite washer/dryer and jetted tub. Good news! Westgate Lakes Resort Orlando is a pet-friendly resort, so you don’t have to leave your four-legged family member behind. Take advantage of Westgate Lakes Resort & Spa's free shuttle service to SeaWorld®, Universal Orlando® and Walt Disney World® (Call ahead to reserve your seat – they fill up quickly!) SeaWorld® features shows, animal experiences and rides. Shows include Dolphin Days, Ocean Discovery and Sea Lions Tonite. Get up-close and personal with a dolphin in the Dolphin Up-Close Tour experience or see five species of penguin at the Antarctica: Empire of the Penguin Habitat. Experience the South Pole through the eyes of a penguin on the Antarctica: Empire of the Penguin Ride. It’s a motion-based simulator and offers two versions: mild and wild. Ride Mako, Orlando’s tallest, fastest and longest roller coaster. Universal Orlando® features two theme parks: Universal Studios® and Universal’s Islands of Adventure®. Join your fellow muggles and experience The Wizarding World of Harry Potter®. Ride through movies like E.T., Jurassic Park, Transformers and Despicable Me. Walt Disney World® features four theme parks. Magic Kingdom® is home to classic Disney attractions Jungle Cruise®, Pirates of the Caribbean® and It’s a Small World® along with New Fantasyland®. Soarin’®, Frozen Ever After® and The World Showcase® can be found at Epcot. See Beauty and the Beast Live On Stage, ride the Rock’n’Roller Coaster starring Aerosmith and test your bravery on the Twilight Zone Tower of Terror at Hollywood Studios®. Pandora – The World of Avatar® is at Animal Kingdom®.